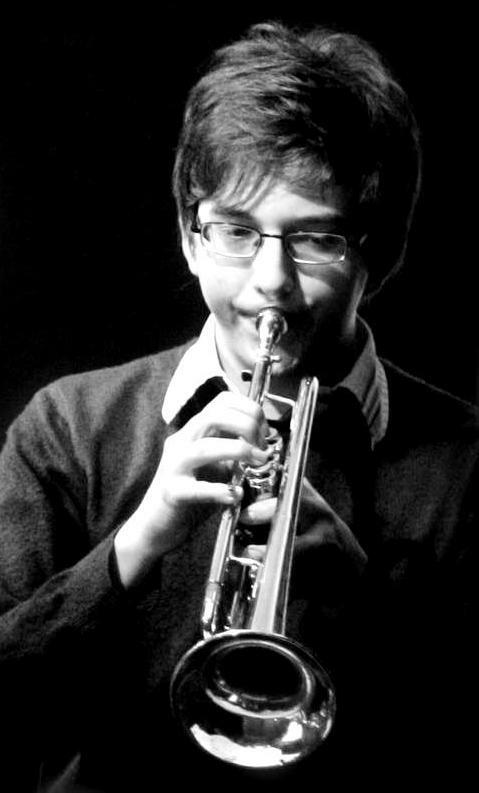 Freddie Gavita is a first class trumpeter and has degree in jazz from the Royal Academy of Music to prove it. Freddie is a favourite of the British Jazz Scene – playing with the Ronnie Scott’s Big Band and the John Dankworth Orchestra. We can’t wait to hear his own Big Band perform at the London Jazz Festival, and then he’s off on tour with superstars Empirical next year! However, Freddie is just a boy from Norwich (we checked on a map. It’s in East England) and is…how should we put this? Very much into Norwich City Football team. When we asked him what he was looking forward to in Kentucky, he responded ‘Trying not to eat chicken all day, hanging out with the band, meeting some new people, looking at some horses.’ We should also tell you, that Freddie’s dead pan face is so good, most people can’t tell if he’s joking or not. Classic British humour if you ask us. Freddie has a collection of model vintage cars, a phobia of crumbs and all the meals he can cook involve minced beef. He also enjoys Xbox 360, football (there’s a surprise), and swimming. Freddie’s deep jazz roots ground Blue Flamingo Jazz in British sounds. With soulful improvisation, a unique sense of humour and utmost professionalism, Freddie is a guy to look out for on stage! Dan Farrant is a magical Bass Player. Literally. He is a keen magician – and you should see what he can do on a Bass! He’s studying at the Royal Academy of Music and doing wonders there. Dan, like fellow Blue Flamingo Leah, is a Londoner to the heart – and has been around the block with Blue Flamingo. He also has the unique ability to talk whilst simultaneously having a discussion with you. (It’s hard – we’ve tried). Dan is busy performing all over London, and is currently playing with singing sensation Elisa Caleb. He’s also has his own quintet, and is involved with the jazz scene at the Royal Academy of Music. Dan, in his normal creative style, noted that he was most looking forward to ‘McDonalds’ in Kentucky. The boy gets points for originality there. Though he is looking forward to heading Stateside. 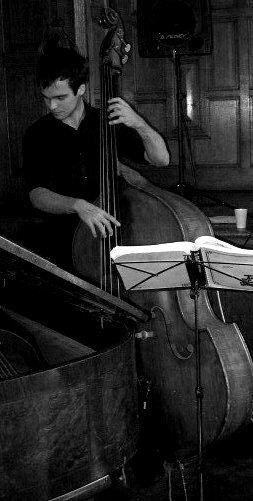 Look out for him – not only will he have his electric bass, but he’ll also be giving it all he’s got on an old-school upright bass! Dan’s creativity and originality means that he brings much more to the Blue Flamingo group than just keeping us in time. He’s a musician who likes to surprise, loves to play, and inspires those around him. 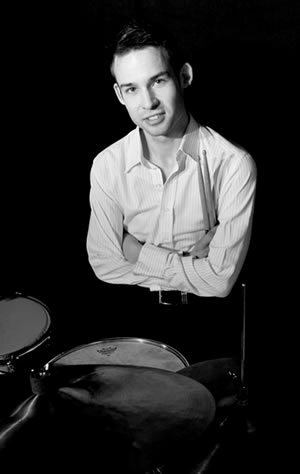 Andy Ball is a drummer with qualifications, having studied at both Leeds College of Music, and the Royal Academy of Music. Andy is from Stourgbridge in the West Midlands, though he has seen the world, performing at festivals in Ireland, New York, Los Angeles and Hong Kong. Just as fellow Blue Flamingos Leah and Phil, Andy is involved in music education, taking his septet into primary schools and running workshops. He will also be performing the newly composed (and interestingly named?) narrated jazz suite The Green Mystery of Woolpit. Andy’s breadth of experience, education and spontaneity puts a fire under the Blue Flamingo musicians. His ability to play with intense quiet energy as well as fierce funk soul is the power behind much of the Blue Flamingo Beat.